Discussion in 'Everything Else Goats' started by AlleysChicks, Oct 20, 2018. Hey y’all What do you guys use to keep your goats water clean? Winter is starting to creep in with freezing temps here so I recently switched my small water bucket for a large tub. I’m hoping that with a large tub and a de-icer to make less trips out and cut down my chore time in winter. But I’m worried about green dirty water, so any tips that don’t involve dumping the tub every couple days is welcome. If I'm not of a mood to clean my goat's trough (an old claw foot tub), and the only issue is algae, I pour bleach into the trough while re-filling it. The bleach kills the algae and evaporates in a short period of time so no harm done to the goats. A good alternative to bleach is distilled vinegar (the clear or white vinegar). I use it to clean our watering troughs with and then once the trough is clean, I empty a 1 gallon jug of the stuff in our 50 gallon trough and then fill with water. 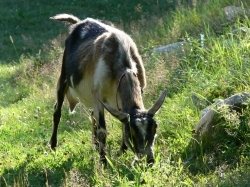 The vinegar keeps the algae from growing and the goats will actually consume more water which is a good thing for them. Plus, there's an old wive's tale that says if their drinking water has vinegar in it, you'll get more female offspring. I don't put too much stock on the wive's tale, but the vinegar sure is a more natural way to keep clean, clear water in your watering troughs.